On my General List of Celebrity Don’ts, there were several items relating to social media. Mostly things like “don’t get into Twitter fights” and “don’t reference yourself in a tweet”, but one thing I didn’t mention—because I thought we were past this, honestly—was “don’t join Twitter then act like you don’t know what it is”. The celebrity “oh my gosh Twitter, what is it even?” act was tolerable—barely—in 2008 and 2009, when Twitter broke out and spread like wildfire and celebrities were signing up every day and there weren’t Twitter social norms yet. But now? Years after everyone and their mother stampeded onto Twitter, when tweets are used as sources for news stories and are quoted no differently than a sound bite of actual dialogue? Now it seems disingenuous to act like Twitter is a baffling new thing that is just so gosh darn confusing. I bring this up because John Krasinski joined Twitter this week and his first tweets were in that vein of “I don’t know what this is and that’s funny!” Actually his first tweet involved both “YOLO” and three exclamation points. There are a lot of exclamation points on John Krasinski’s Twitter. Ugh. As we discovered over the summer with Tom Hiddleston, Twitter can kill a celebrity crush faster than almost anything. A lot of you, Lainey included, had to fantasy-divorce Hiddleston after seeing his Twitter. But Hiddleston, it turned out, is a huge nerd and his dorky Twitter is just part and parcel of his being a huge nerd. I never pegged Krasinski as the guy who would be giggly and twee on Twitter though. Oh, sure, he’s got a dorky streak in him. But I really don’t think of Krasinski that way. In fact, I’m more willing to buy his pseudo-intellectual writer persona. Krasinski makes movies with Matt Damon and Gus Van Sant, he’s developing a TV project with Aaron Sorkin, he hangs out with Dave Eggers and the literati in New York. Krasinski is funny, and charming, and he projects a relative degree of normalcy, but he also wants us to think of him as a writer, a developer of ideas, a little bit elite and more than just “Jim from The Office”. Until he joined Twitter. Now it’s exclamation points and “OMG I’m so old, I don’t get this” (Krasinski is 33, hardly “too old for Twitter”) and YOLO and gushy tweets with fans. I just didn’t figure him for the kind of person who uses an excessive amount of exclamation points, but apparently he is. And no, it’s not the end of the world, and it’s not a problem if Krasinski is a dork. But that edge of try-hard puts me off. 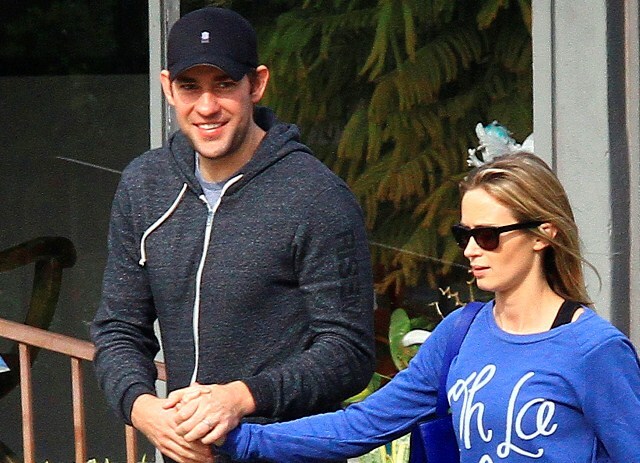 Krasinski has accomplished a lot already and he’s got solid prospects for post-Office life. Why can’t he, as Duana put it, be easy? 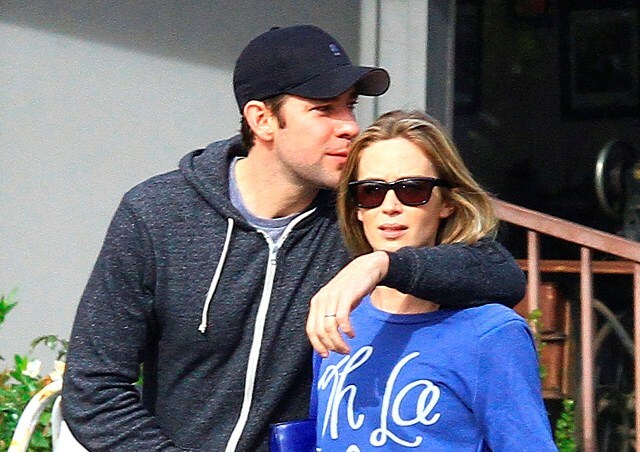 Look at him and wife Emily Blunt, the day that Blunt got her fourth Golden Globe nomination. They’re adorable, and he’s all over her in a sweet, non-gross way. Doesn’t he look so cute and easy and, well, secure, openly gloating over his wife’s accomplishment—an accomplishment he has not yet achieved himself? Yet there’s no sign of the jealousy or pettishness that plagues most actor/actor relationships. Where is this confidence on his Twitter? All actors are insecure, to some degree. I just prefer not to see that insecurity played out on my timeline.